The P14DG distributed generator interconnection protection IED brings the design rigour and technology of transmission applications to the entire utility and industrial market. The P14DG offers complete, cost-effective and highly reliable protection for interconnecting distributed generators to the grid.The footprint of the device physical size, and the lifecycle environmental impact have been minimised using state-of-the-art design, component, and process selection. 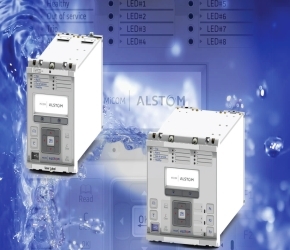 Ethernet, graphical programmable logic, and proven protection, measurement and control algorithms from Alstom Grid's modular MiCOM P40 are native in the new range.Agile solutions from Alstom are ideal for new-build and retrofit alike. MiCOM P40 Agile IEDs provide an integrated solution for the complete protection, control and monitoring of electrical power systems. Application for overhead lines, underground cables, busbars, breakers, transformers, reactors, distributed generation and motors is supported, right from distribution (as primary protection) to transmission voltage levels. The IEDs are suitable for application in-solidly earthed, resistance-earthed, and Petersen coil systems alike. A wide range of protection functions as standard allows the user to conveniently scale the application, which is then readily adapted via simple enable/disable feature selection in the Configuration menu. The IEDs offer a universal wide-range power supply, universal 1A/5A CT inputs (software selectable in P14* models), and universal binary inputs – the latter with programmable pickup thresholds.